The Toshiba Excite Go. (Image: Toshiba). Toshiba Corp. has launched a new line of tablets – including a seven-inch offering with an appealing price point of about $110. Announcing its new lineup today, Toshiba unveiled the Excite Go, which runs Android KitKat (4.4) Weighing in at just 12.5 ounces, it’s small enough to fit neatly into one hand and looks like a good option for consuming content, basic gaming, checking email, and other tasks like that. Inside its body is a quad-core Intel Atom processor, and to sweeten the deal, it comes preloaded with a full version of Microsoft’s OfficeSuite Pro. And besides its 16 gigabytes (GB) of internal storage, the sides of its body also feature a microSD card slot for up to 128 gigabytes of external memory, plus a microUSB port. The Excite Go comes with a multi-touch display with a resolution of 1024 x 600, and while that’s not the best on the market, it’s hard to argue with a price tag of $110. 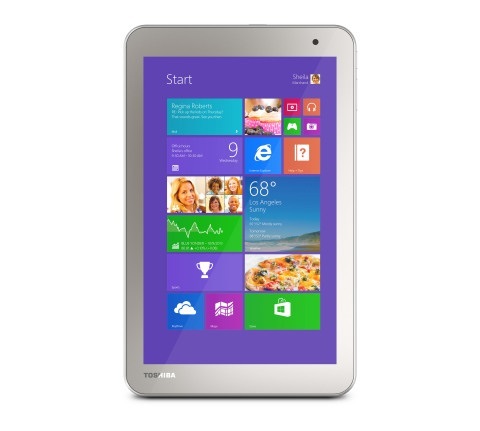 Toshiba also announced two Windows 8.1 tablets, adding a line called the Encore 2. Coming in two versions, the eight-inch and 10-inch versions, the eight inch version weighs less than a pound, while the 10-inch weighs about 1.2 pounds. Both of them have a 1280×800 multi-touch display in high definition, though Toshiba is touting the eight-inch edition for content consumption like reading, entertainment, and gaming, while the 10-inch can be used to edit documents, browse the Internet, and to watch movies. They also come with quad-core Intel Atom processors, up to 10 hours’ worth of battery life, 802.11n Wi-Fi connectivity, and a micro HDMI port to work with compatible HD TVs. The Encore 2 tablets include up to 64 GB of storage, as well as up to 128 GB of external memory through microSD card slots. There is also a microUSB 2.0 port for charging, plus an HD webcam and a five megapixel rear camera. 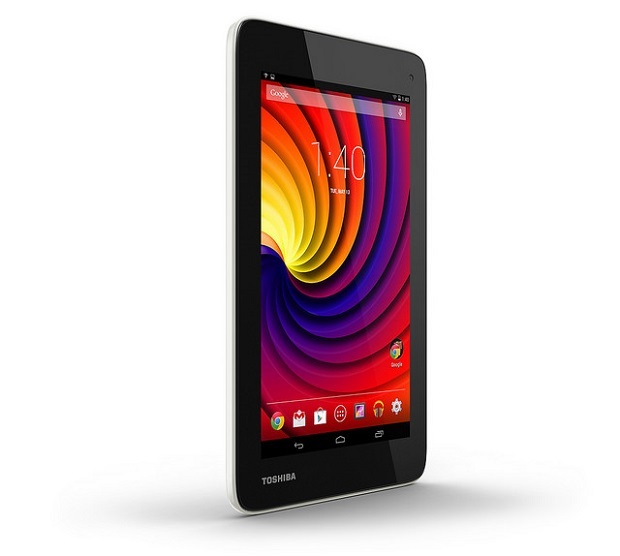 The Toshiba Encore 2 tablet. (Image: Toshiba). And as an added bonus, they include a one-year subscription to Office 365 Personal6, a suite that includes full versions of Word, Excel, PowerPoint, OneNote, and OutLook, as well as Microsoft OneDrive. Pricing for the eight-inch version of the Encore 2 starts around $200, while the 10-inch edition starts at around $270. While Toshiba hasn’t shared Canadian availability dates, all three tablets will be coming to “select retailers” in early July.